After the National Guard was federalized in 1941, Neriani's company moved to Camp Blanding, Florida. Neriani recalls, "Camp Blanding, Florida is the sandiest place, and in the summer it is the hottest. There were times when we had only one canteen of water on a twenty mile march in the summer time. . . That was difficult." At that time in Florida, dirt was dug from the sides of the roads to make mounds in the center, leaving troughs that would fill up with dirty water. Neriani said. "Some of the fellows went in there and drank that dirty water. And fortunately, on that particular march, we found an African American who owned some watermelons and we bought the watermelons – they saved us. Guys were passing out who couldn't take it. Some, very few." After the attack on Pearl Harbor on December 7, 1941, Neriani knew that his one year of volunteer service in the National Guard would not be his last. Soon he found himself battling the cold and the enemy inside the Huertgen Forest, one of the longest and bloodiest campaigns of the war during the Allies' long-fought effort to reach the Rhine River inside Germany. (3) But first, Neriani had even more training to go through in the States. Toward the end of training in Florida, a tent-mate put Neriani's name on a list of soldiers who wanted to be considered for Officer Candidate School. Out of the twenty-six names on the list, only Neriani and one other solder were accepted. Neriani graduated from Officer Candidate School on December 30. 1942, trained in the United States for another year as the commander of Defense Platoon. Headquarters Company. 8th Infantry Division, and then shipped out with the 8th Division to Northern Ireland for more training in preparation for the invasion of Europe. While Neriani was in Ireland, General Patton visited the camp to review the 18.000 men in the 8th Division Units. Neriani recalls the way Patton swore, even in front of the Red Cross women. While inspecting the line of troops, Patton stopped in front of Neriani and asked. "How goes it. Lieutenant?" before moving down the line of men. Neriani distinctly remembers Patton's blue eyes and his two pearl handled pistols. Neriani, a 2nd Lieutenant at the time, led the platoon that defended the headquarters company in case of attack. With some pleasure, Neriani remembers, "I had three anti-tank guns – 57 mm, three bazookas, three machine guns, some of the guys with rifles also." Neriani credits his job with the headquarters company as the reason he survived the war. He said, "If I was in a rifle company in Normandy or in Huertgen Forest, I wouldn't be here talking to you." While in Normandy, Neriani caught his first prisoner. He said. "I'll never forget that there was a shot and I could hear the crack of the bullet right near my head and it was in a hedge row. Now we didn't face the hedge row directly; it was down the length of the hedge row. I put a sergeant on my left side and a corporal on my right side, and I went down the middle and fortunately the German didn't shoot me because he could have killed me easily, but of course he would have been shot by my two men. He was smart and didn't shoot me, and I didn't shoot him. He became a prisoner. I brought him to the prisoner's cage, and he went in with all the other German prisoners. He was an officer." The combat action of the war was never that far away. One day, American planes bombed the line in Normandy. Neriani said, "I was about 500 yards from where the bombs were landing and the thing was it was July and very dry. When the bombs were landing they created a huge dust cloud, and there was a gentle wind from the German side to our side. The bombers that came over last didn't have a target. All they had was the dust. So they bombed in the dust and that cost us over 1,000 men according to what I read recently [in the Veterans of Foreign Affairs Newsletter], and it cost three anti-tank men, and it caused General McNair's death. It was a huge, huge mistake by our people not knowing this could happen." Even for a defense unit, danger was always imminent. As part of his duty protecting headquarters, Neriani sometimes had to find new spots for headquarters to set up. Coming out of Normandy, when his division reached La Haye du Puits, Neriani needed a place for the kitchen stoves. He remembers. "I went in with my jeep in the apple orchard, came out with my jeep, and the kitchen truck started to go in, went in, and when the kitchen truck came out empty, it got blown up. They [the Germans] set that mine so it would go off after four metal objects passed over it. So I was pretty lucky in that one. Good thing I wasn't number four." It is with this general outlook of getting by each day that Neriani made it through the war. He downplays his involvement in the fighting in Europe, so much so that he refused a Bronze Star "because there were 12 or 13 officers who graduated from Infantry school with the 8th Division. The only one that wasn't wounded or killed was me. I was the only one. I told them I didn't do enough, and they took the Bronze Star back." Regardless, one cannot argue that Neriani did not spend his time in the war in combat and constant danger, especially once he entered the Huertgen Forest. The weather did not make the situation in Huertgen Forest any easier. In addition to constantly being surrounded by an enemy who was familiar with the surroundings and fully set up with powerful weapons in the woods, the ground was so frozen that it was almost impossible to dig a hole in which to hide. Neriani said, "If you were fortunate to get a German hole you were lucky. The thing was that some of the fellows in the rifle platoon would take the M-1 and shoot a clip in a round hole, then with a bayonet they would dig out the hole. When they got it deep enough, they would put in a concussion grenade and the concussion grenade would open up the soil. We'd have to do that if we didn't get a German hole." Neriani said, "We never should have gone into Huertgen Forest. You try going into a Forest and the enemy is waiting right there looking at you all the time. You don't see them; they see you and they used to shoot first. And they had machine guns with one machine gun covered the next machine gun. If you knocked out one machine gun, you're under fire from this one." Neriani remembers the close calls he had with the enemy inside the forest: "I was on the right side of the road leading towards the town of Hurtgen. The Germans had us in their view all the time. They were excellent soldiers. They had camouflage, they had the right equipment; there was no shortage there. I walked out on the road and there was a dusting of snow on the road. The Germans saw me on the road and they fired mortars. I ran a mortar squad for a while and know how long it takes when you see someone to set up your mortar squad to shoot, so I stood there for a while and I got out quick because I knew they were going to fire. And they did. One mortar round came right between [my] footprints." Neriani quickly vacated the area. Neriani considers the Huertgen Forest to be the heaviest fighting he saw. The Americans finally captured the town of Hurtgen end November 1944, around the time of the Battle of the Bulge. After Huertgen Forest. Neriani traveled into Germany behind the 101st Infantry Division. At one point, they came across a small concentration camp. The 101st could not stop, so Neriani's group entered the camp. Neriani remembers. "There were two pits about maybe seven or eight yards wide, 30 yards long. They were all filled with dead people. My platoon was the first one there to go in the camp. When I got in the camp. I saw all the ditches with the dead bodies, but in this brick house with a dirt floor, there was a row of guys sitting down around the wall on the sides (and) the back. They're all sitting down and they're all there with their eyes open. I said Hi to one guy – no answer. I said it again – no answer. I went to move him and he fell over. They were all dead. Every one of them was dead." Neriani continues, "There was one man who was on his bunk – they had two levels of bunks and he was up on this bunk and he was lying there and we always carried something for food. When you didn't have anything to eat, we had this chocolate. So I broke off a piece of chocolate and gave it to him and he smiled. By the time I walked around the building, which is maybe 25 feet by 30, I came back to him again, and he was dead. I could see the chocolate on his lips." It was at this time that a sergeant came over to Neriani to tell him about a camp next door filled with Polish women who worked in the fields. The sergeant said, "The women want that big Nazi flag they got over there in their camp." Neriani replied. "Why would they want the big Nazi flag?" The Sergeant replied that the women wanted to make brassieres and they wanted to use the Nazi flags! 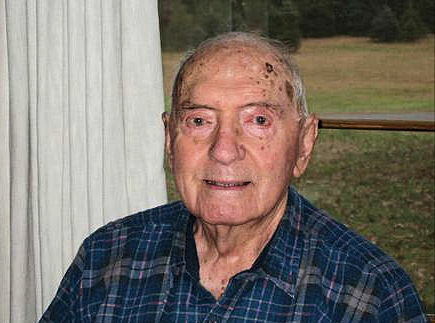 Mr. Neriani, image taken in 2008. By this time in the war, now into 1945, German soldiers were ready to surrender to the Americans, and were actually glad to give themselves up rather than face being a prisoner of the Russian army. On the road one day, the Americans came across three German soldiers with a while flag. An American soldier who spoke German learned from them that they were representing 1.000 more men in the woods, also waiting to surrender. We arrived in Rott, Germany, west of Huertgen Forest, in early November. Two German tanks had been abandoned there, evidence of the tank battle that had taken place earlier. One Mark-4 had about 5 gouges in its front from our tank fire, but not a single shell had penetrated. The crew must have jumped out and surrendered. The second was a German "tiger" tank that had been using a building as a shield. It would move out, fire, then briefly retreat behind the building. Fortunately, our tank gunners shot and disabled its tracks, and it was unable to move farther. We had a quick practice shooting at these tanks with our 57mm anti-tank gun. We could not penetrate the tiger armor, but we were able to damage the sides and tracks of both vehicles. We were equipped with the new French-made SABOT anti-tank shell. It was the most penetrating round, but scarce, so we used it sparingly. The 8th Div. consisted of the 13th, 28th, and 121th regiments, along with the supporting artillery and the 12th Engineers. The 121st was considered our best regiment. Division Headquarters was divided into two sections as Hdq. Forward and Hdq. Rear. Hdq. Forward consisted of G-l, G-2, and G-3, Div. Chief of Staff Col. Cross, and Asst. Div. Cmdr. Brigadier Gen. Charles Canham. My men had been assigned to protect Gen. Canham, who had participated in the initial D-Day landing. The new Div. Cmdr. was Major Gen. Bryant E. Moore. Div. Forward was sometimes forward of the regimental headquarters in order to push the regiment to perform better and keep pressing ahead. My job at times was to find a new position for the Hdq. with the help of a Lt. Col. who was also in charge of helping to make the site selection. Div. Forward was always in control of the action and always very close to or forward of the regiments. My job, with my platoon, was then to set up the anti-tank guns and the machine guns, to patrol around Hdq. and to guard Div. Hdq. through the night. Fighting in Huertgen Forest was a terrible scene and a terrible experience. The Germans had all the advantages. They were familiar with every tree and rock and path in the forest. They were experts with camouflage, mines, wire and machine guns, and their greatest plus was in their "pillboxes". All the forest fire lanes, each about 20 yards wide, were equipped with concrete pillboxes arranged so that when we advanced we had to pass them, and each was protected by a neighboring one. It took many pounds of explosives to blow up a pillbox, and this could be done only at close range at the cost of many lives. The most successful way to destroy a pillbox was by surrounding it if possible. When we were able to do this, any Germans still alive inside would surrender. The battle of Huertgen Forest was, in my opinion, a terrible waste of soldiers' lives. There was no need to go through the forest. Of 120,000 GIs who took part in the action, 30,000 became casualties, dead, wounded or deformed by trench foot. With feet constantly wet day and night, toes would begin to rot, turn black and require amputation. Our casualties in Huertgen even exceeded those of the Marines in the capture of Iwo Jima. The Germans boasted that American losses in Huertgen Forest were four times the number of German casualties. During the winter our M-1 rifles would not operate properly until someone devised a powder lubricant that kept the guns from jamming. The former lubricants had simply frozen and rendered the guns useless. For the Americans, Huertgen was so disastrous that many soldiers reached the point of despair and jumped out of their foxholes or slit trenches, hoping to be shot and receive minor wounds that would remove them from being all-day, every-day targets of the German guns. In Eisenhower's book one small paragraph was devoted to this awful battle. His justification for it was that the enemy could have used this area as an avenue of attack. That was foolishness. It would have been impossible for the Germans to launch a successful attack when there was only one small road going through the forest. Of course, it's human nature to resist letting the world know when a deadly mistake has been made, but I saw the ambulances steadily bringing up replacements and taking away the dead bodies. In Bradley's book there was another foolish excuse in one small paragraph. 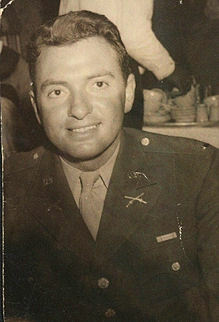 He claimed that by having to fight in Huertgen Forest the Germans had fewer forces to use in the Battle of the Bulge. That was true, but since our casualties were four times theirs, the reduction in our forces was also quadruple theirs. The German general who defended the forest offered the most practical answer. He said the Americans could easily have gone around the forest instead of through it. It had no military significance, to either side. Involved in this disastrous battle were the best army divisions in Europe, our 3rd Armored and 1st, 2nd, 4th, 8th, 9th, and later, the 83rd and 78th Infantry Divisions. After the 28th Div. was decimated, then replaced by the 8th Div., our target was the town of Huertgen at the northern edge of the forest. It was captured by Co. E of the 121st Inf., commanded by 1st Lt. Boesch. He said they had been fortunate because the Germans had dug a trench from the house where they were staying to the forest. 1st Lt. Boesch and his troops crawled up the trench at night and were first to reach Huertgen. With the help of the 121st they routed the Germans out of houses and cellars and captured more than 200 prisoners. That was November, 29, 1944. In Stephen Ambrose's book he stated that 1st Lt. Boesch was wounded, but that's not precisely true. 1st Lt. Boesch had his headquarters in the cellar of a house in Huertgen, and on one trip down the muddy stairway he slipped and hurt his back. He was evacuated immediately. 1st Lt. Boesch was never promoted to the rank of captain or higher. He led a platoon in Brittany and the company in Huertgen Forest. Good combat men were not removed from the front lines because their leadership saved lives. The cold weather brought temperatures often below zero and a foot-and-a-half of snow. Because of constant mortar and artillery fire, we slept in a slit trench that was covered with logs and dirt. Trying to avoid freezing, we doubled our layers of clothing. For two months the only items we changed were our socks, and that was in an effort to prevent trench foot. Because trench foot was so widespread, we were ordered to change our socks regularly or be court-martialed. If any man was caught out of his hole during enemy mortar or artillery fire, the best place to stay was against a tree trunk. But when German fire struck the trees, it created serious additional threats from the flying splinters. The only way to dig a new hole was to fire an M-1 rifle in a small circle to break the frozen surface, dig out the loosened chunks, then use a concussion grenade to start the hole. This was not a simple task to be done quickly and quietly. After the capture of Huertgen we were gaining little ground because of the pillboxes north of the town. I was asked to fire my anti-tank gun into the slits of the pillboxes at about 300 yards. It almost turned into a disaster for my one gun. I saw that mortar fire would be coming, and after 5 rounds I took my gun out of action immediately. Mortar fire was raining down on the attic from where I was directing our fire. The attic had a 5-foot hole in the roof from previous artillery fire. I was observing from this hole, and the Germans knew it. As mortar and artillery fire began to hit the roof, it was obvious that any one of them might strike through the opening. I dove down the stairway. We followed a firebreak that led to the road to the town of Huertgen, which was about 400 yards away. The Germans fired upon everything that moved through the break. At night the 12th Engineers hung burlap bags on the north side of the road to obstruct the Germans' view, but we were still fired upon. There was a spur of woods from the north side of the road to the road's edge. After all the damage we sustained, we sent a patrol into the woods. Sure enough, there was a Nazi soldier up in a tree with a phone. He was directing their mortar and artillery fire, and it was accurate. He called the mortars on my squad, but he was quickly disposed of, and we were able to use that intersection to get into Huertgen and beyond.